If I lay out all of the expectations for our second semester, it could lead to a small panic attack. Having a child in Foundations and Essentials and another in Challenge B is certainly a bit overwhelming (My hat is completely off to people who have more children than I do!). THE PARENT IS THE TEACHER. I am not a slave to the Classical Conversations curriculum. It is a beautiful way of educating my children - a curriculum that guides me and helps me focus on what is truly important. Like any curriculum, however, it is NOT my master. That doesn't mean I can change it so much that it is unrecognizable, but it does mean I can add or subtract things and that we have sufficient "wiggle room" to adapt to meet the needs our family. I am thankful for Classical Conversations at large and for our local community. As we approach our first community day of Cycle 3 second semester I wanted to share some resources blog posts I've found that might be of help to you. As always, get ready to dive into some serious goodness! 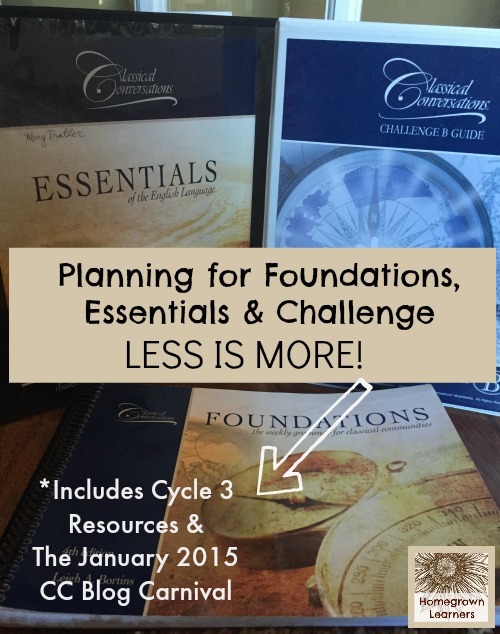 My friend, Lara, has written a post about Homeschooling with Foundations. Lara has children younger than mine and offers a valuable perspective for those of you with littles. Half-a-Hundred Acre Wood has so many great ideas for us. Brandy's Cycle 3 weekly links help me plan and find engaging resources to supplement the memory work. Please know I don't always supplement the memory work. Some weeks we ONLY do the memory work. This Memory Work Folder from 101 Days of Homeschooling is VERY simple -- I have not used this, but do something similar. I love watching the creativity of Solagratia Mom throughout the year. She writes about how she is gearing up for the next 12 weeks. Melissa, at The Cork Board, shares her simplified plans with us. Brandy has also created free printable notebooking pages for the Cycle 3 artists. You know we love notebooking, so my son will be using there. Since music is our thing we will spend much time with the composers and musical selections for Cycle 3. We will be listening to the pieces and completing SQUILT notebooking pages for each one. If you aren't familiar with my SQUILT music appreciation curriculum, I encourage you to take a look -- it teaches you and your children HOW TO LISTEN to a beautiful piece of music. Each volume presents the GRAMMAR of music, and then encourages your child to use and apply that grammar when listening to a beautiful piece of music. In Foundations this cycle we will be looking at Romantic and Modern Era music. Good news! The Romantic Era SQUILT volume has already been released, and the Modern Era volume will be released at the end of this month! I've written a lot about how we approach the history memory work in CC. You can read about our history notebook and download a booklist for Cycle 3 Weeks 13-24. 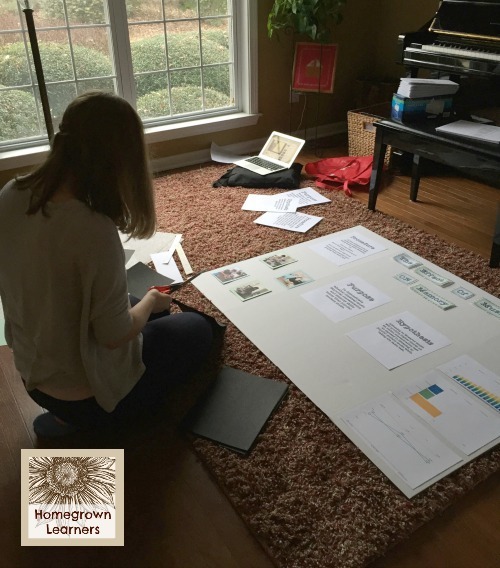 History is the centerpiece of our homeschool and we spend a lot of time reading, notebooking, and searching for ways to expand in this area. Map Tracing is huge for us - and we will continue with that during second semester. 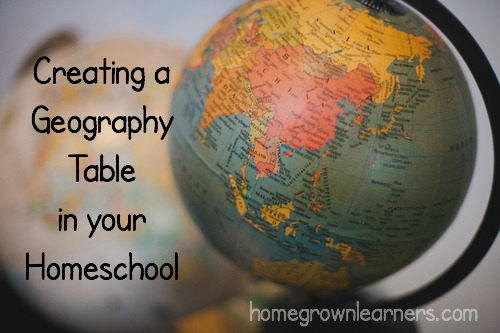 I created a Geography Table and much time is spent here! We are using a wonderful little game - Race to the Colosseum - to help us memorize John 1 in Latin. It is simple and fun. Perfect! We don't do anything fancy for math. Saxon Math works very well in our house. Each of my children do a lesson each day and we don't normally stray from that plan. Math games are very important. We will continue to use Mega Fun Card Game Math and Math Dice to reinforce the concept of "playing with numbers". We are relatively new to Essentials. I love that my child loves to diagram sentences. I love that he loves to write. We copy charts and complete our IEW lessons. I follow the program to the letter and it is working! 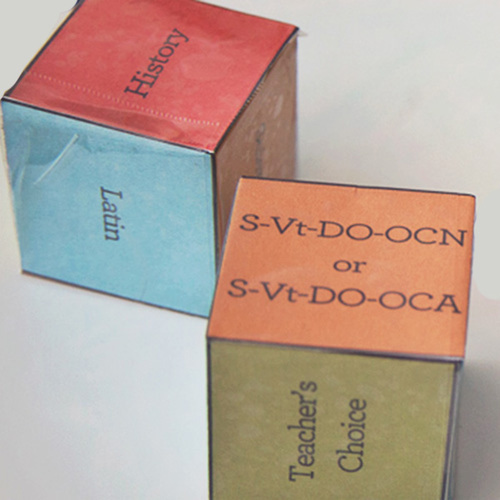 These Roll a Sentence cubes from Antiquated Notions are WONDERFUL for reviewing the patterns of sentences! Where do I begin with Challenge? This program has been such a blessing for my 8th grader. We are learning how to tailor the curriculum to fit HER needs. These middle school years are tough no matter how you slice it, and I love how she is being eased into accountability and pride in her work. She's just completed a science fair project that she did 100% on her own! NO HELP FROM MOM! I'm so very proud of her - and once the fair has happened I will share the entire project with you! Learning to step back and let your child shoulder their education is hard for a homeschooling mom (or at least it is hard for me). Those failures are invaluable and the successes are all the sweeter when our children have OWNERSHIP. My child, in particular, needs time for creativity and service - two things that are very important to her. We carve out a morning each week for her to volunteer at a local preschool, and also give her plenty of ways (through her schoolwork) to be CREATIVE. You MUST read this post from Heidi, at Mt. Hope Chronicles. She says everything I wanted to say in such a beautiful way. Thank you, Heidi. *A special thank you to all of the bloggers who submitted articles for this month's carnival. What a blessing to have so many talented moms sharing their gifts so freely with all of us! Click here to see past issues of the carnival and for how to submit your own post to the carnival in the future! 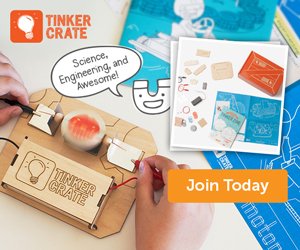 Are you a part of the Homegrown Learners' community?